A Priestess performs the ancient ceremony of drawing down the moon. 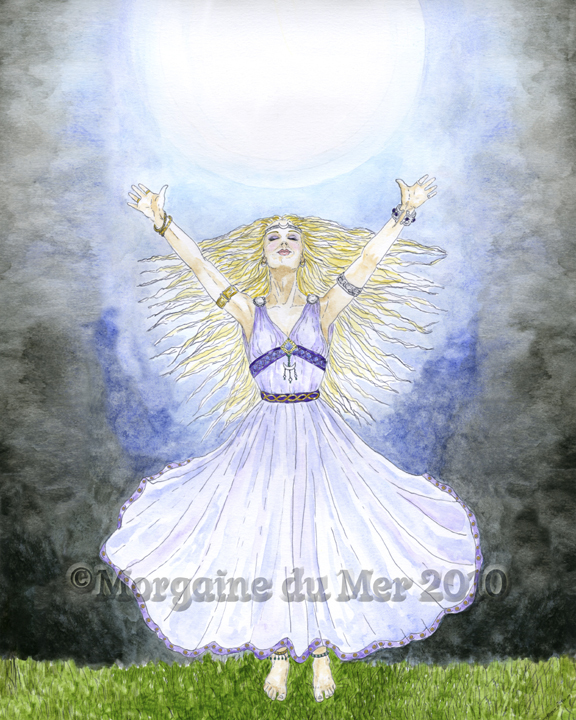 She invokes the power of the Goddess at the peak of her power under the light of a bright full moon. 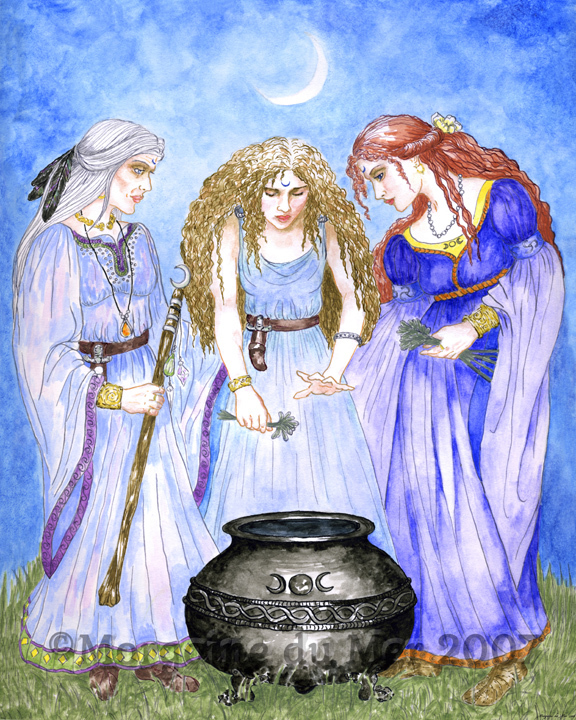 In a grassy clearing at twilight, three Priestesses prepare a magick cauldron for a New Moon Ritual. 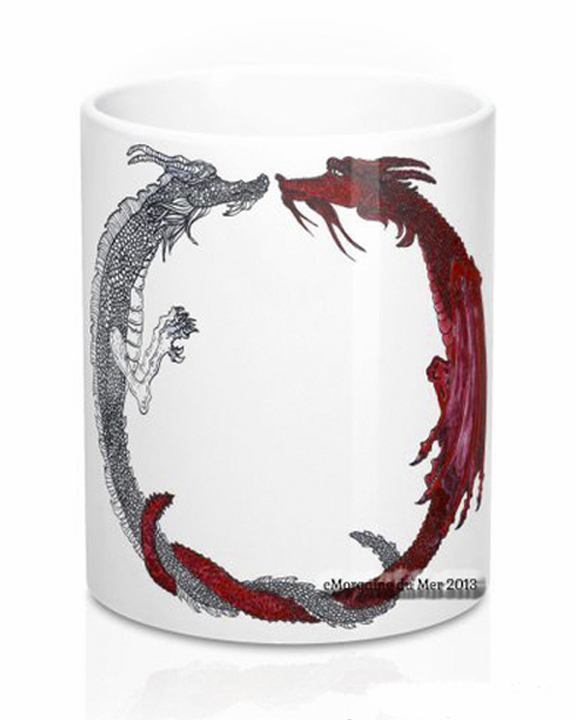 From Elder to Mother to Maiden, the Sacred Knowledge is passed. 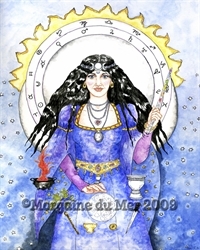 Inspired by the Tarot, the High Priestess is shown with the 4 Elements surrounded by Spirit, Sun, Moon, Zodiac and Planet symbols. 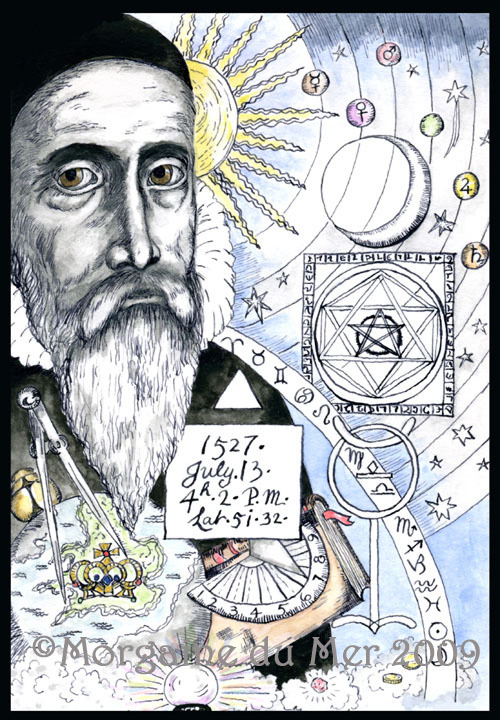 Astrologer, alchemist, mathematician, mapmaker, philosopher, mystic, advisor to Queen Elizabeth I. Extremely learned, he amassed one of the greatest libraries of the Renaissance. The candle illuminates the wizard's workshop. All of his magickal tools are assembled. 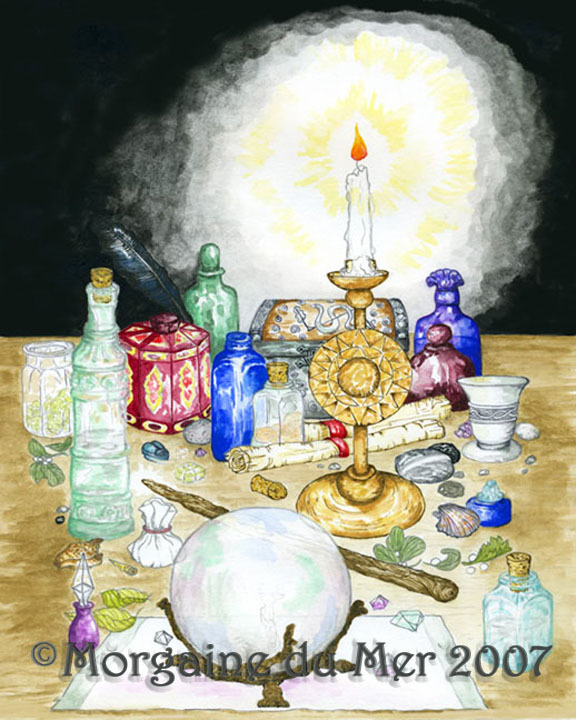 A wand, crystal ball, various bottles and tins filled with mysterious ingredients and secret scrolls sit on his table, waiting to be used in magick spells. 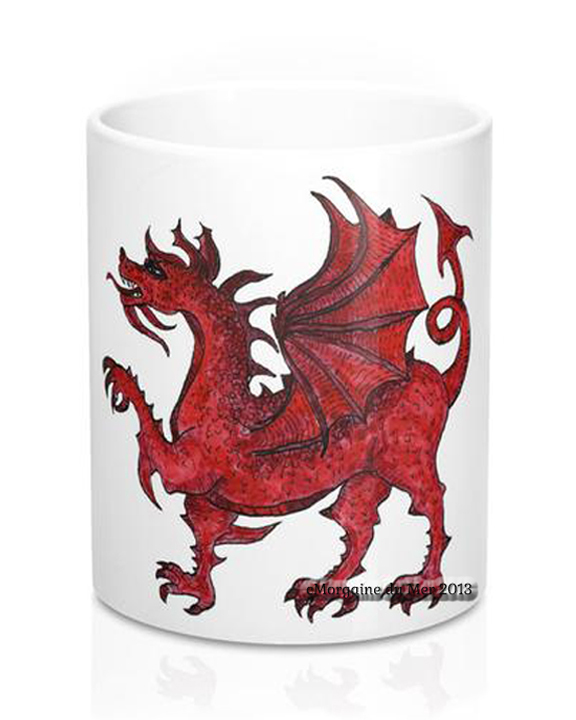 In Druidical lore, the red winged dragon symbolizes niter, the active principle of alchemy. The white wingless dragon symbolizes salt, the passive principle of alchemy. Wizards learn the secrets of the Universe, including summoning the elements of air, fire, water and earth. As the full moon appears from behind the clouds, lightning, thunder, rain, wind, stars and coloured lights emanate from the Wizard's hands. 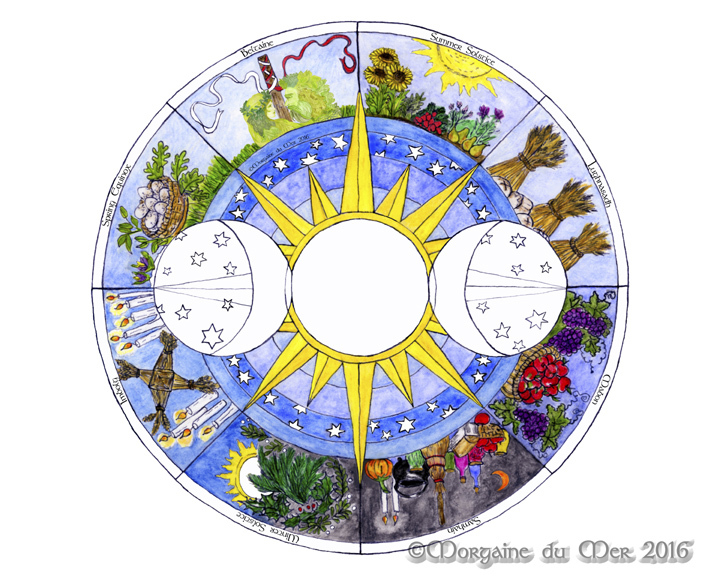 The four alchemical elements of Air, Fire, Water and Earth comprise all matter of Nature. The fifth element is pure Spirit, which encompasses all. 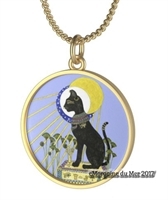 The Spirit of Fire wears a dress of ethereal vapor decorated with a sun pendant. 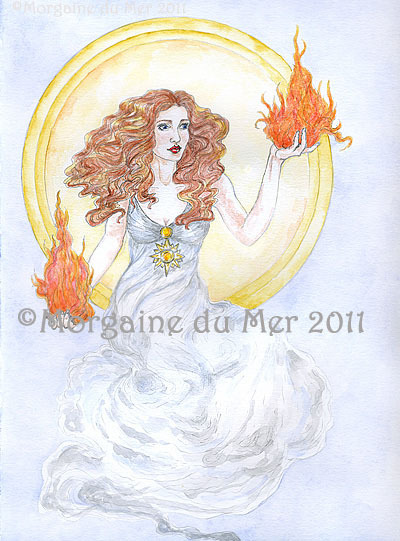 She is pictured in front of the sun orb and holds eternal flames. 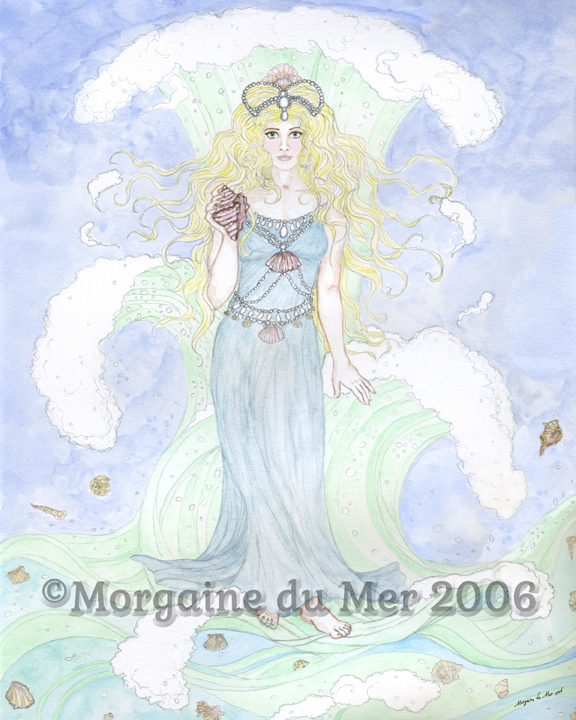 An Undine, the water elemental, rises from the sea wearing a crown of pearls and surrounded by shells. This water faerie can gain a soul if she marries a mortal and gives birth to his child. 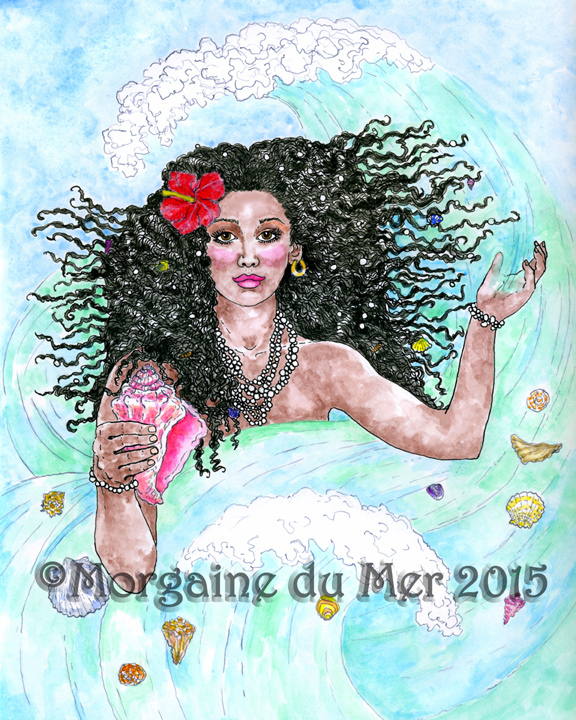 But if he is unfaithful, she returns to the sea. 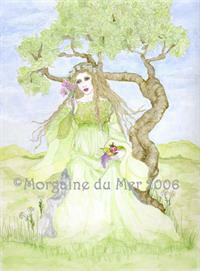 Wearing a leafy dress of Spring green, the pregnant Earth Mother gives life and beauty to growing things. A Sylph is an ethereal being representing the Elemental of Air. 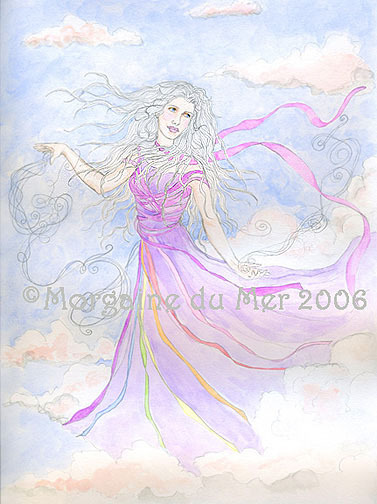 In a dress of heavenly violet and strands of coloured light from a rainbow, this Sylph moves through the clouds dispersing gentle breezes. First described by Paracelsus, the great Renaissance physician, occultist, alchemist and astrologer as an invisible being of the air. 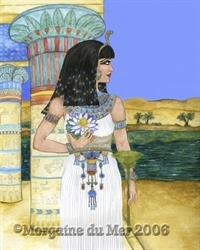 Isis is the daughter of Geb (God of the Earth) and Nut (Sky Goddess). 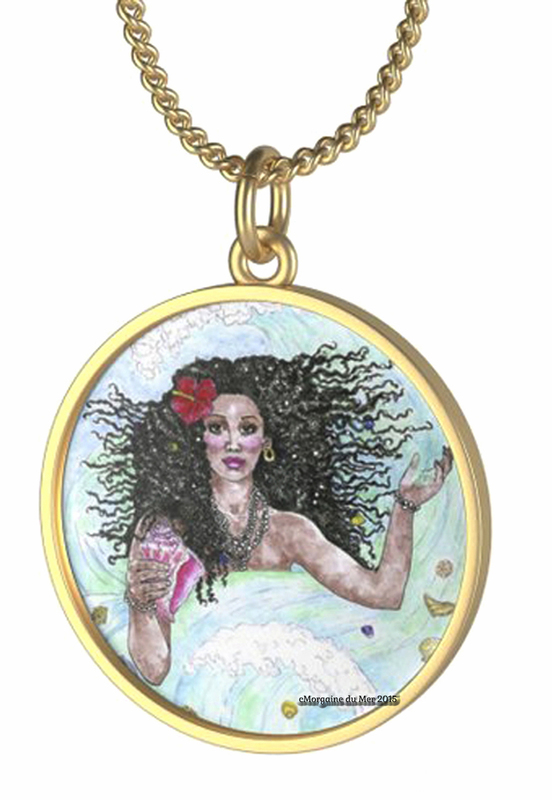 She is the Goddess of motherhood and fertility and the protector of children. 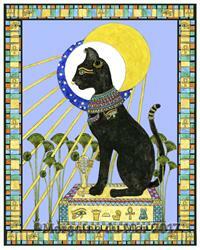 With her magickal skills she brought her husband, Osiris, back to life after he had been murdered by his brother Set. 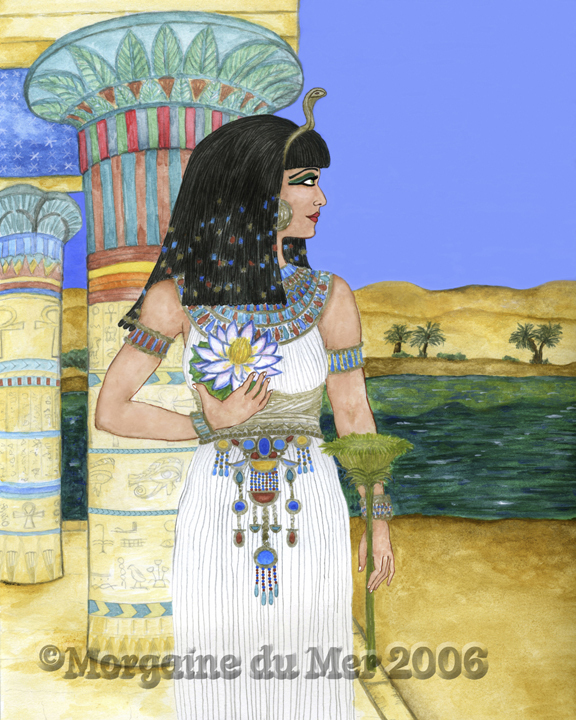 She is depicted looking out on the Nile River holding the illusive Egyptian Blue Water Lily (often referred to as the Blue Lotus), a sacred flower prized for it's divine essence and the papyrus flower wand. Isis was worshiped in ancient Greece and Rome as well and many temples were built in her honour. Chief God of the Norse and Ruler of Asgard, Odhinn sacrificed himself by hanging upside on Yggdrasil (the World Tree) for nine days in order to gain wisdom of the mysteries. 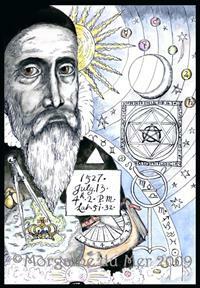 He learned the magick of the Runes, knowledge of self and the cosmos. 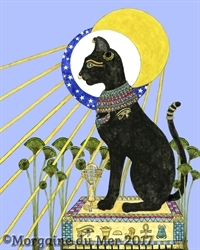 He is associated with the hunt, war and poetry. 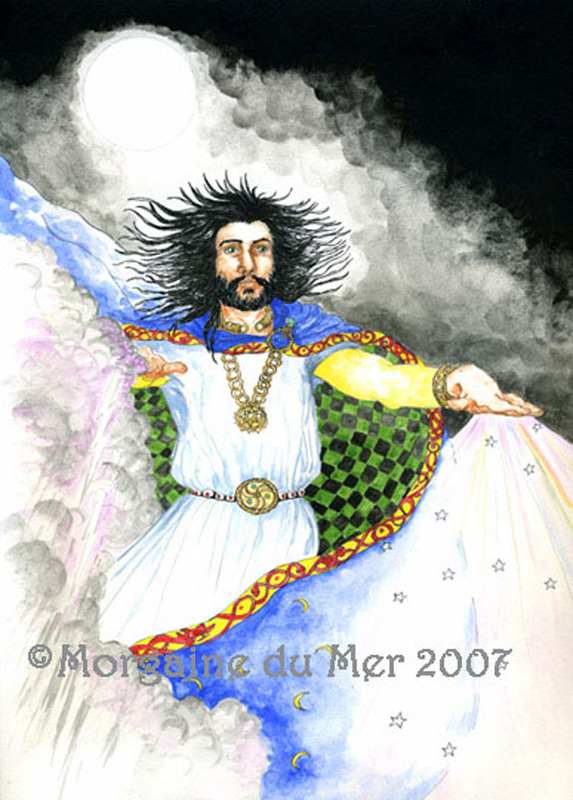 He is often portrayed as "the Wanderer". By disguising himself with a floppy hat and staff, blind in one eye, he mingles with mortals. 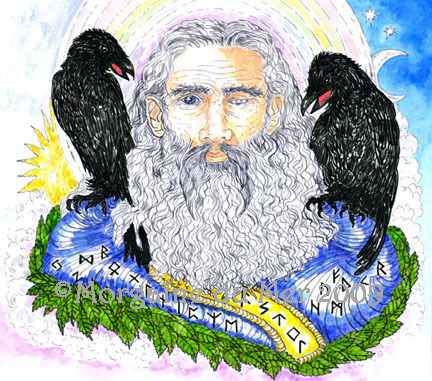 When presiding in Asgard, he receives news from his two Ravens, Huginn (thought) and Muninn (memory) who fly around the world and report the daily happenings. 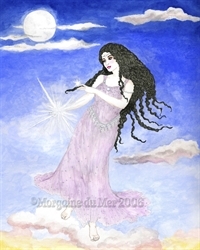 Astarte is the Mesopotamian Goddess of the Evening Star. 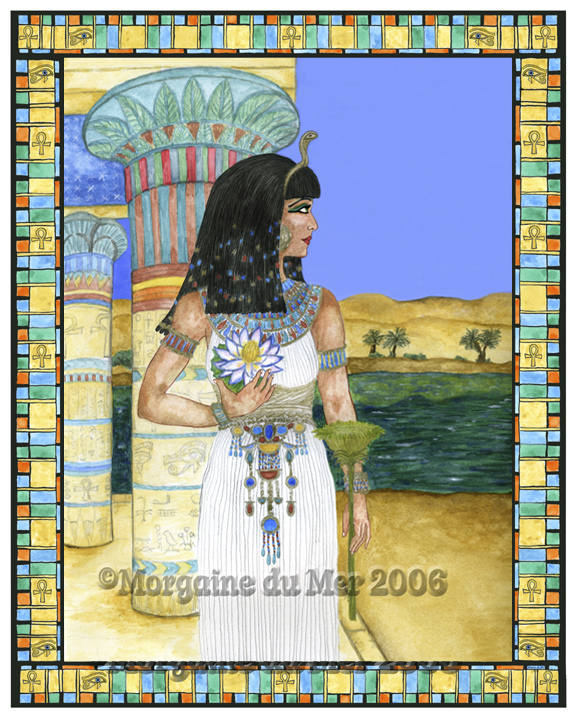 She is also a Goddess of fertility and war. She walks on the clouds as the sun begins to set and illuminates the first star to shine. 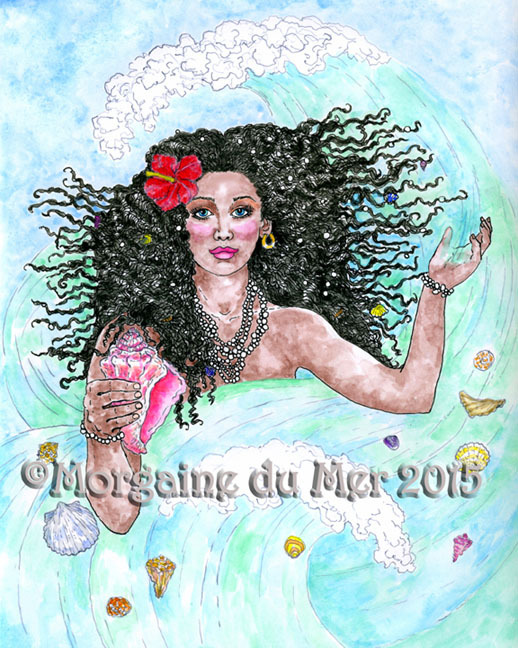 Yemaya, an Ocean Goddess, is the Mother of All Living Things in the Yoruba and Santeria traditions. 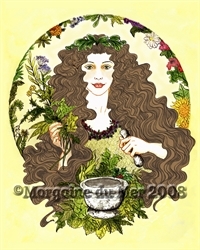 Airmid is the Celtic Goddess of Herbs and Healing. 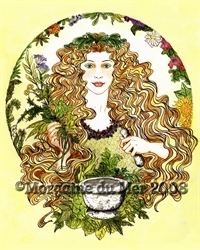 Surrounded by healing herbs and flowers, Airmid wears a crown of mistletoe, a necklace of blackberries and a dress of leaves. She uses her trusty mortar and pestle. 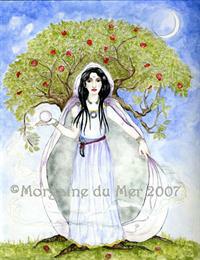 Airmid was the daughter of Diancecht, master physician of the Tuatha De Dannan. 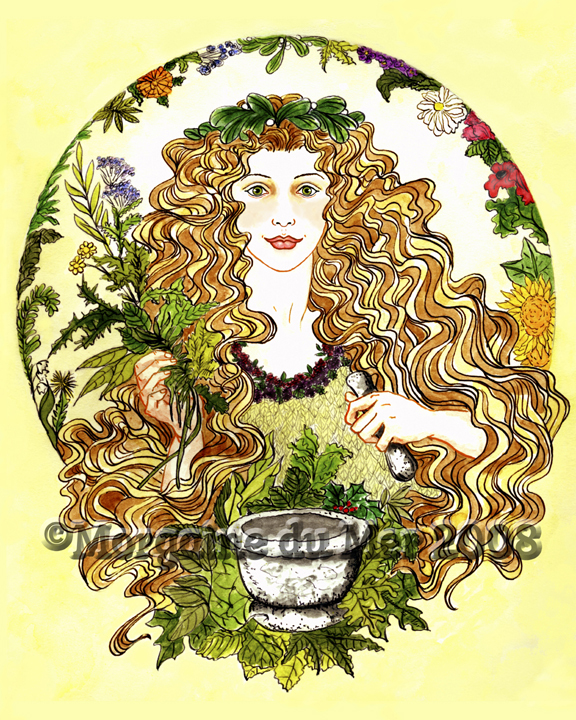 She tended all the herbs of the world and they informed her of all their secrets. Legend says that one day, as she arranged the herbs on her cloak by their properties, her jealous father came along and shook out the cloak, scattering away all the herbal knowledge. A Celtic Crone Goddess, Cerridwen presides over the Cauldron of Knowledge, the contents of which must brew for a year and a day. She is known to shape-shift in the form of a sow. 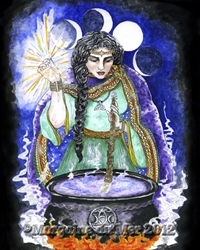 The origin of the witch stirring her cauldron of brew is most likely the image of Cerridwen. Brighid (or Brid) represents the supreme Mother. She is the Celtic Sun Goddess of fertility, fire, creative inspiration, healing and protector of children. 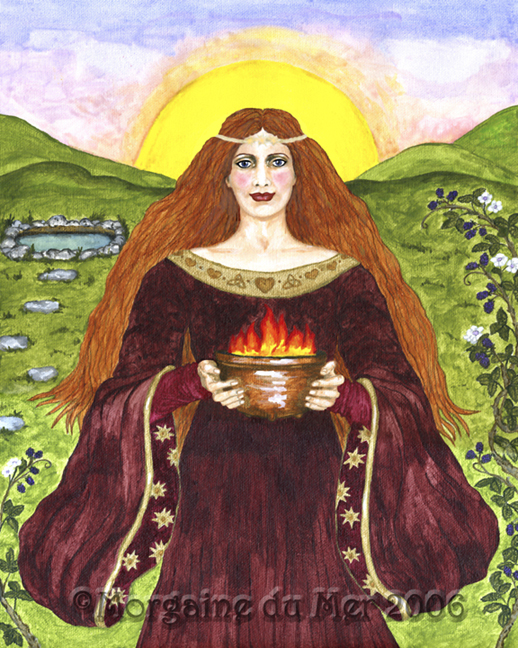 She is honoured at Imbolc, 2nd of February. 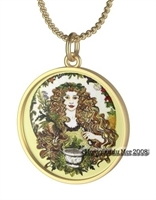 Her symbols include blackberries, natural wells dedicated to her and the heart, an ancient symbol of feminine power. 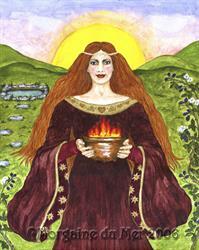 She holds a cauldron of fire as the sun rises in a lush green valley. 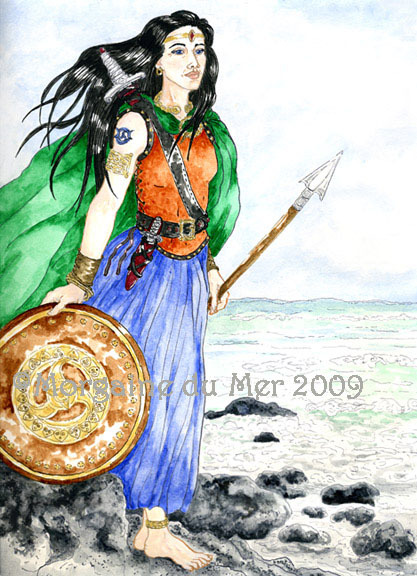 Scathach trained male warriors in her school on the Isle of Shadow (Isle of Skye) in the Hebrides. 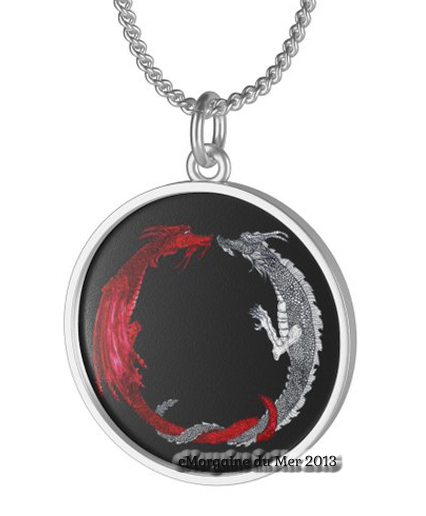 She taught young men various martial arts including a magickal leap. Her name means "Shadowed One". 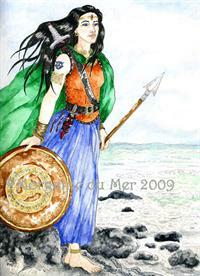 Her most famous pupil was Cuchulain, one of Ireland's greatest heroes. She is wearing ceremonial battle dress. 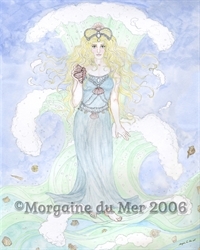 Manannon, Celtic Sea God and his Faerie Queen Wife, Fand are here. The Morrigan is a Celtic Triple Goddess made up of the three crone goddesses of war, death and destruction (Badb, Macha and Nemain). 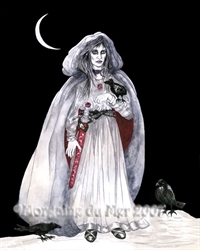 She often appears over a battlefield in the form of a raven (crow). 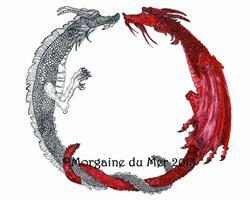 She prophesies the outcome of the battle and often influences it as well. The Beansidhe (usually written in English as Banshee) is the Celtic faery spirit whose keening wail announces an impending death. 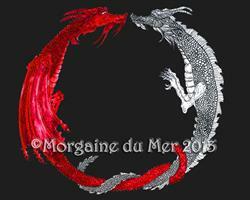 Her lament is usually heard at night. 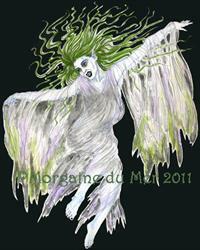 The beansidhe can appear as an ugly hag or as a beautiful woman. To hear the shriek of the Beansidhe or see her is quite scary indeed. An unearthly light radiates from her pale blue skin, green hair and ragged garments. 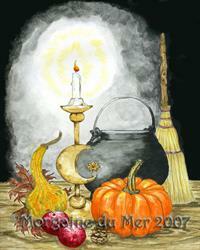 Samhain is the beginning of the old Celtic new year. It is a harvest celebration as well as the night to commune with spirits of the ancestors. 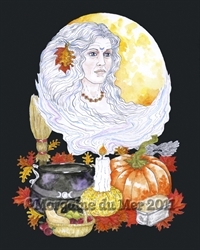 The Crone Goddess watches over Samhain night as the spirits of departed loved ones visit the earthly plane. With a bright candle to light their way, food is served for the spirit visitors. Yule, Winter Solstice or Midwinter is the celebration of the rebirth of the sun after the longest night of the year. The sun symbolizes the God born anew. 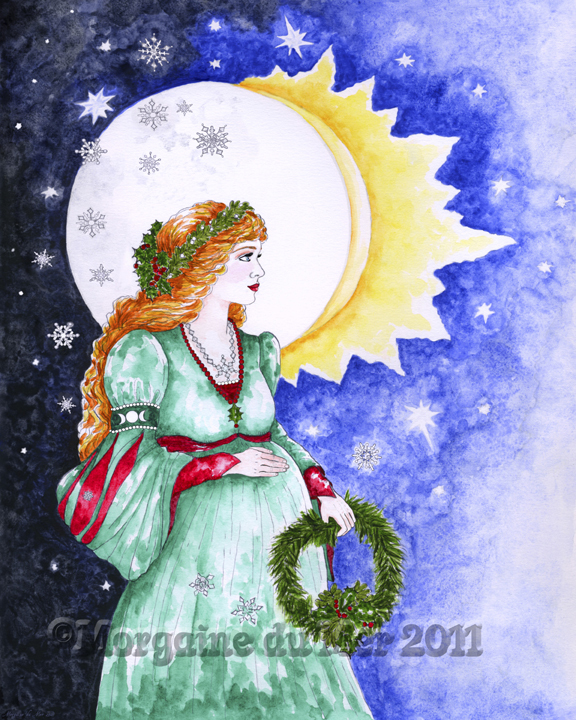 The Goddess at Winter Solstice wears a crown of holly and mistletoe as she awaits the birth of her child. 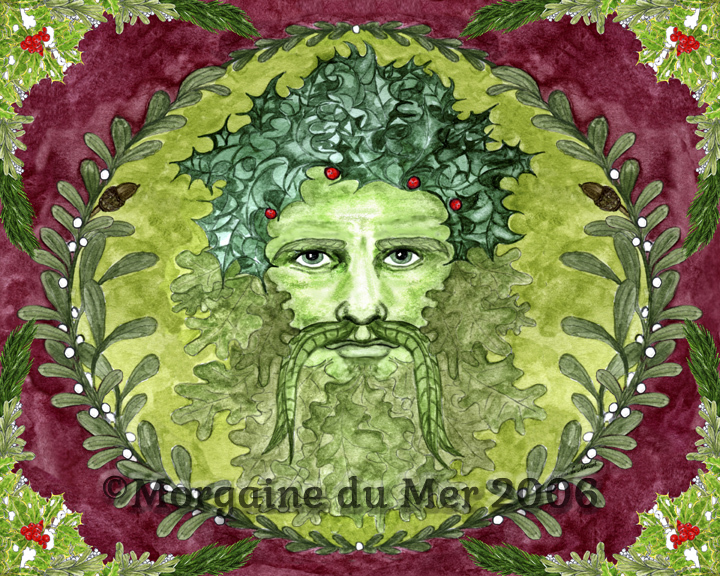 The Holly King is the aspect of the Green Man (Oak King) honoured at the Winter Solstice (Yule) representing the waning year. 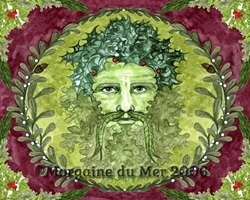 He wears a crown of holly and is surrounded by mistletoe. 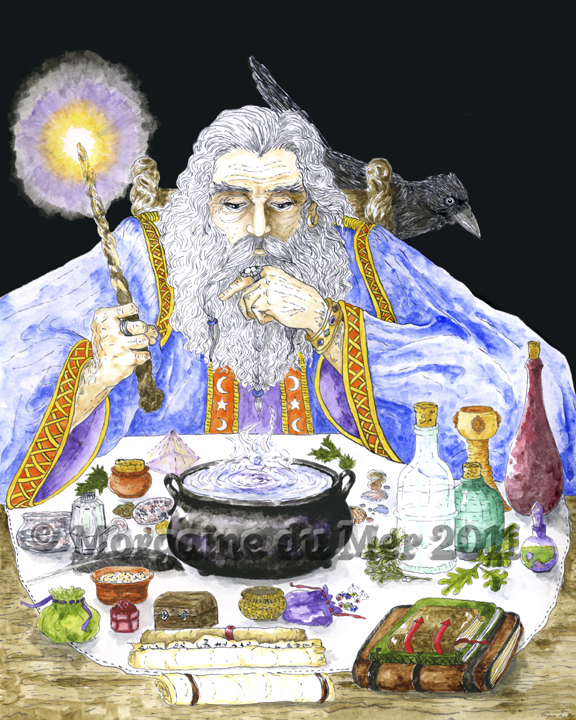 Merlin, sorcerer extraordinaire, uses his wand to light his table as he ponders ideas for magickal workings. His workshop contains a cauldron, mysterious herbs, curious ingredients, a crystal pyramid, a journal, spellbooks and ancient scrolls are at hand. His raven looks on and may offer a bit of advice. The Lady of the Lake is the High Priestess of Avalon. 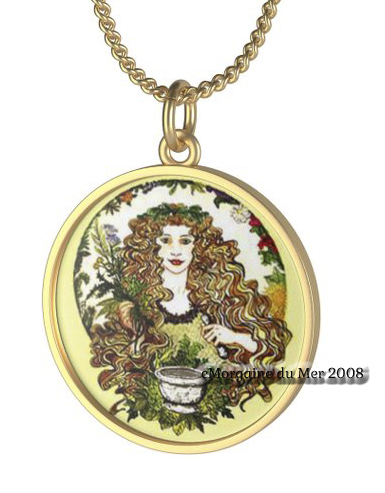 She is of the Fae. 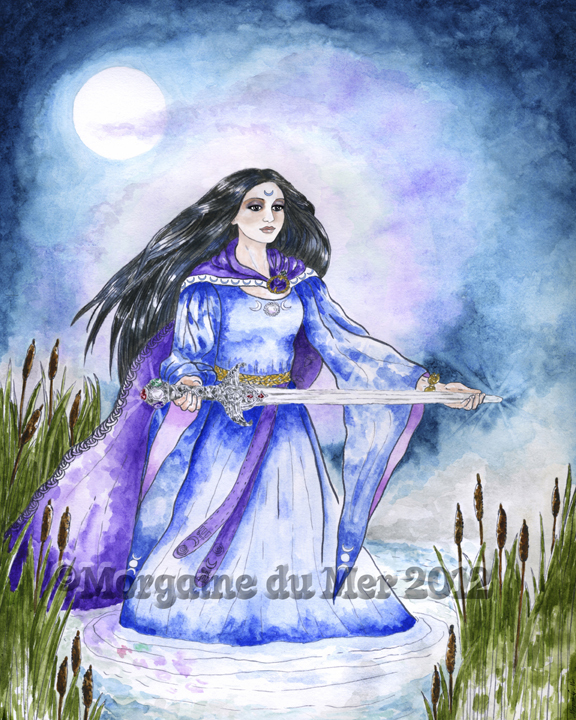 She is emerging from the lake with the magick sword, Excalibur. Morgaine is a Priestess of the Isle of Apples, sister to Lady of the Lake and half-sister to King Arthur. 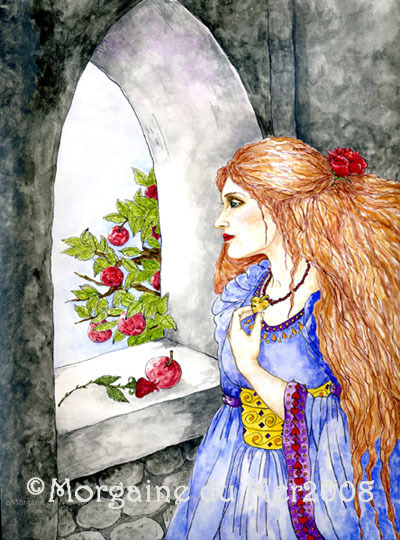 Twilight falls as Guinevere peers from the castle window and awaits her love. Is it Arthur or Lancelot? Winter Solstice, Imbolg, Spring Equinox, Beltaine, Summer Solstice, Lughnasadha, Mabon, Samhain. 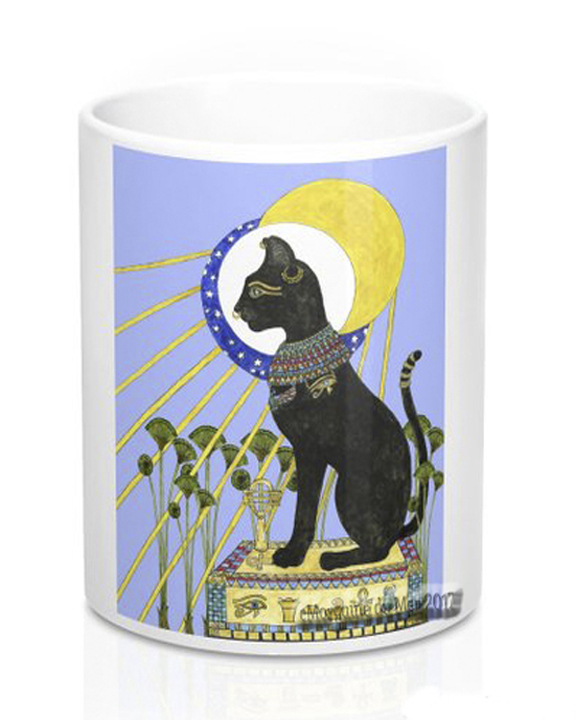 The print can be displayed on your altar and turned as each festival is observed. Goddesses, Gods, and Spirits of the Earth are celebrated in many cultures. 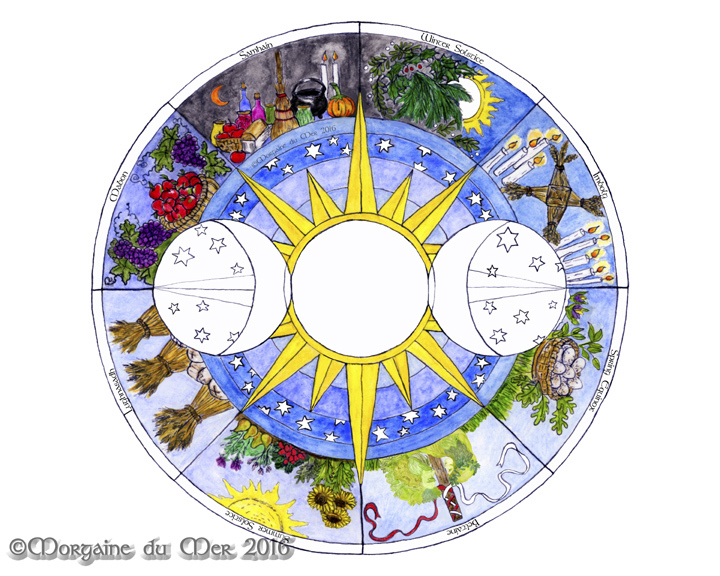 From the dawn of time, humankind has endeavored to discover divine wisdom by channeling celestial energies through ritual. Originally a Warrior Sun Goddess. 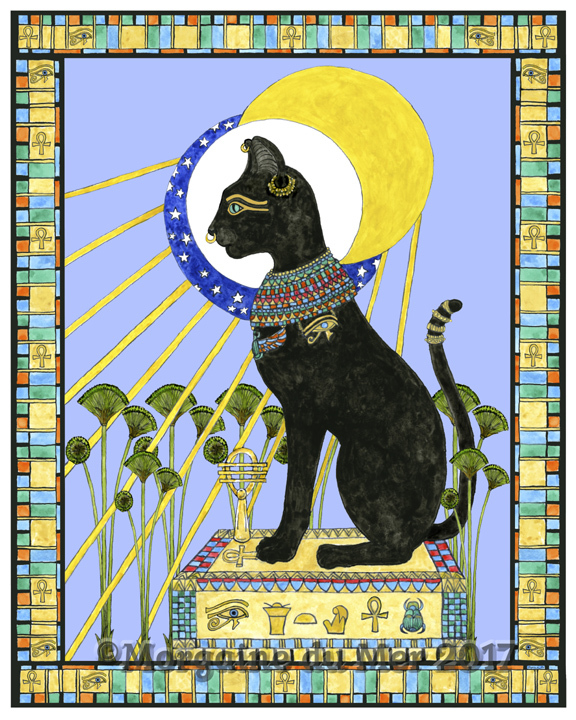 She was later worshipped as a Moon Goddess of protection, music, dance, family and cats. 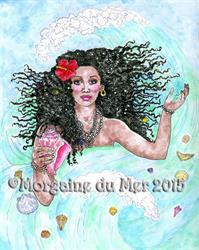 The sistrum, a percussion instrument, is one of her symbols. 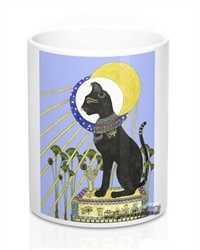 Bastet's name is written in hieroglyphs between the Eye of Horus and the Ankh on her throne. 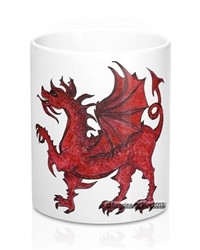 The "Y Ddraig Goch", Red Dragon, is the national symbol of Wales. 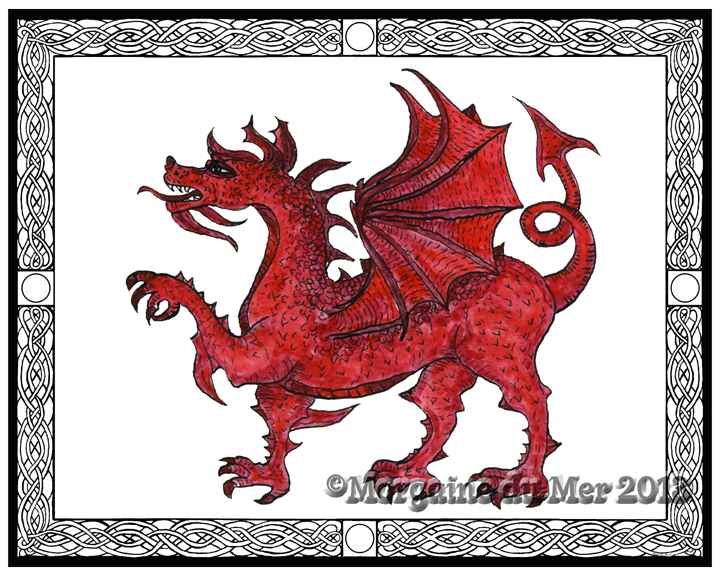 It is said to have been on the flag that King Arthur and other Celtic leaders carried into battle. Horus, the son of Isis and Osiris is depicted as the falcon-headed Sky God. 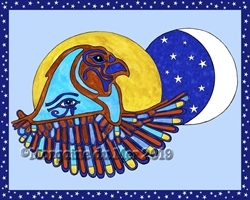 The Eye of Horus is a protection symbol.